I visit the Gold Coast regularly as my friend lives there. 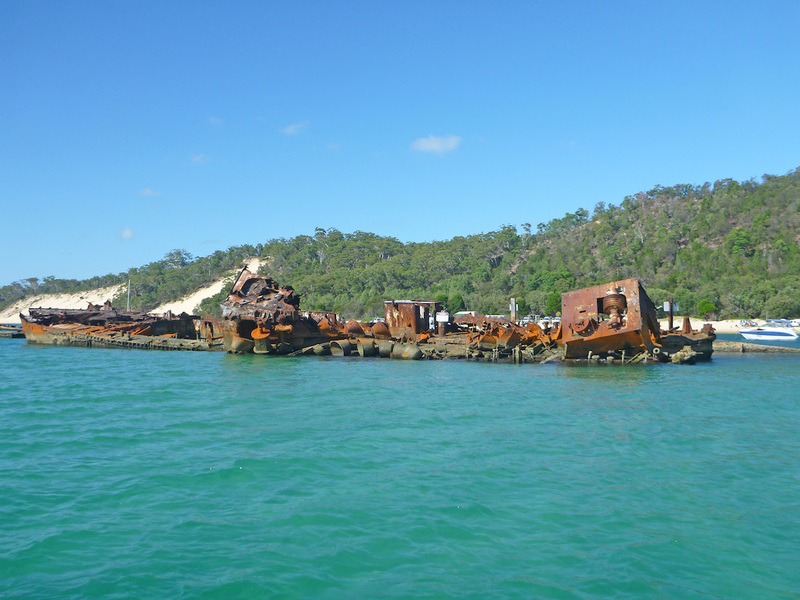 On my last visit, we both decided to visit Moreton Island as neither of us had been there before. We booked an organised day trip with the Scenic Day Tour Group. Moreton Island is about sixty kilometres north-east of Brisbane. It is a popular day tour from both Brisbane and the Gold Coast. A bus picked us up from the Gold Coast and took us to Pinkemba. From Pinkemba, we started the seventy five minute long ferry ride which finished at Tangalooma Jetty on Moreton Island. 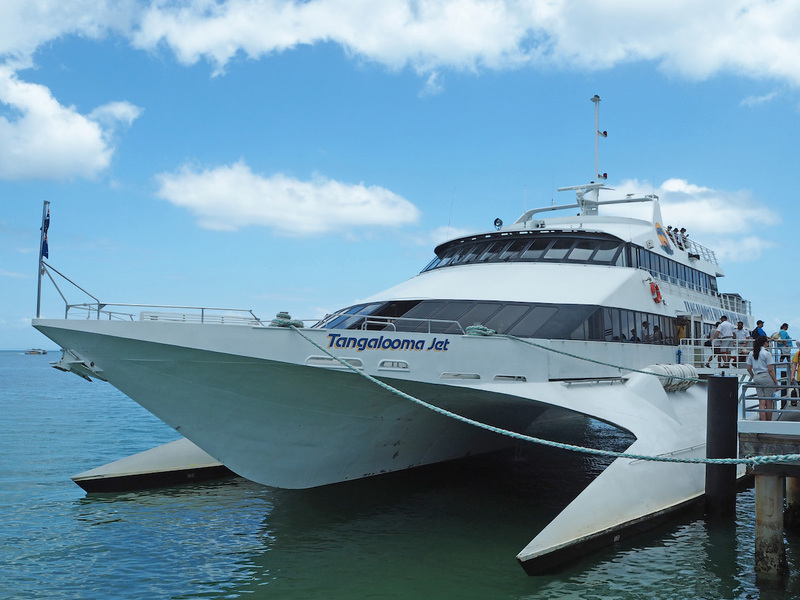 If you go during winter this ferry ride may also include some whale watching. There are many whales around this area during the winter months. Moreton Island is completely made of sand with no road. If you are planning to wander away from the ferry landing you will need to book a tour or hire a four wheel drive. Our first activity on the island was a trip to the sand dunes for some sand tobogganing. 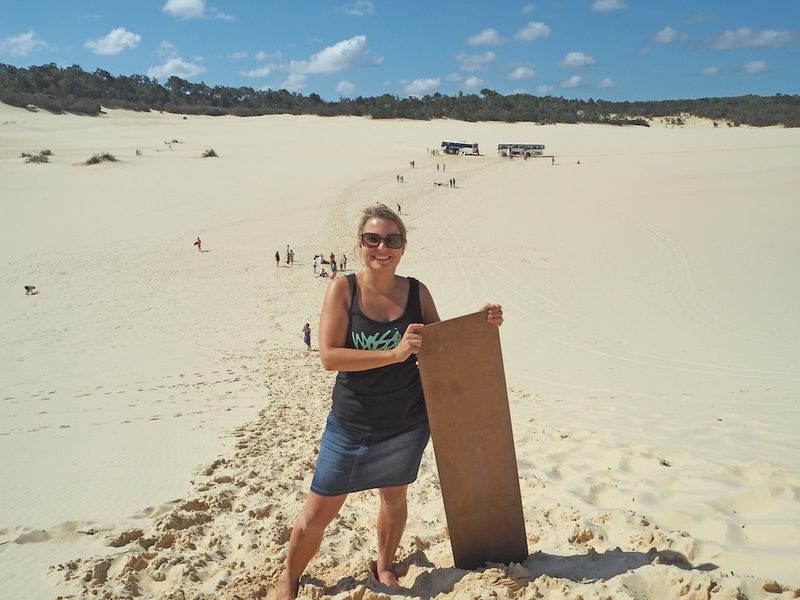 Sand Tobogganing consists of lying face down on a waxed piece of board, and sliding down a sand dune. Pretty scary if you ask me. The tour guide gave us several rules to follow, one of which he repeated three times being “do not open your mouth”. Of course I understood why when I started screaming on my way down! I had so much sand in my mouth, my ears, my eyes (sunglasses did not protect me that well so wear the googles)! Even after five showers I still had sand in my hair! It was fun though, and the view from the top of the sand dunes was fantastic. After our fun time in the sand dunes we signed up for a guided snorkelling tour of the Tangalooma Wrecks. In 1963, fifteen junk ships were deliberately sunk to form a breakwater which made a great wreck dive and snorkelling site. 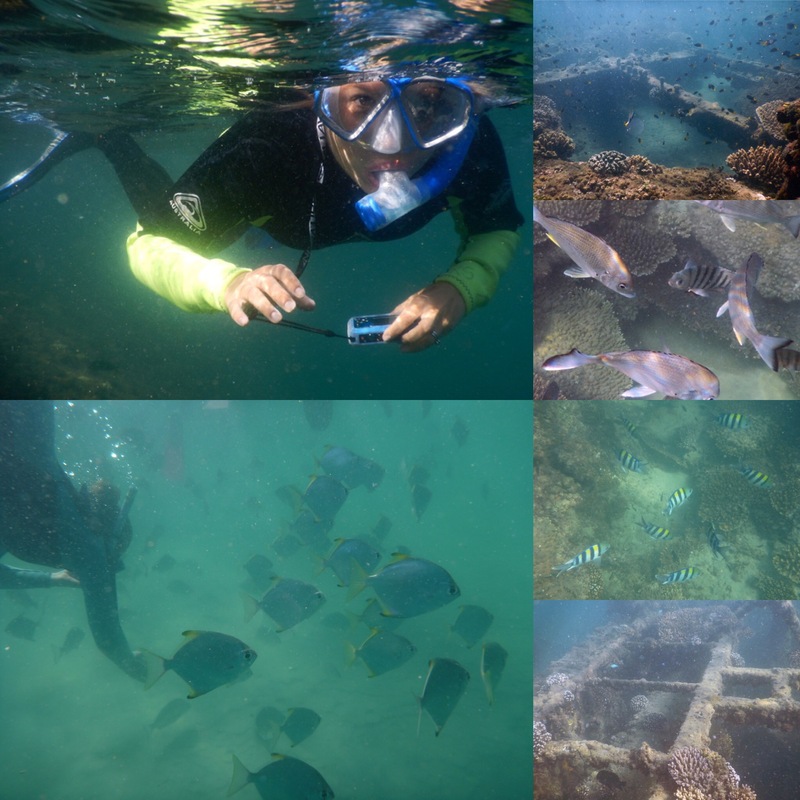 The Tangalooma Wrecks are a must do while on the island. I love snorkelling but I had never snorkelled around a ship wreck before. It was amazing. Lots of beautiful marine life, colourful fish, turtles and coral. And none of the fish were shy of people, happy to swim right next to us. Going on a guided tour is not necessary as you can easily swim out from the beach to the wrecks to begin your own snorkelling. Snorkelling gears can be hired at the resort. You will be able to spend a lot more time at the wrecks if you do it on your own. The guided tour lasted only thirty minutes, which was way too short for my liking since the wrecks were so stunning. I could have easily spent a couple of hours there! There are many more activities to do on the island like ATV tours, helicopter rides, sunset cruises, kayaking, boat hire, whale watching (in season) and more. One day will not be enough if you plan on doing them all. If you wish to stay on the island there are a few accomodation options available. With crystal clear water, white sand and great water temperature the beach at Tangalooma resort is perfect for relaxing after all the activities. 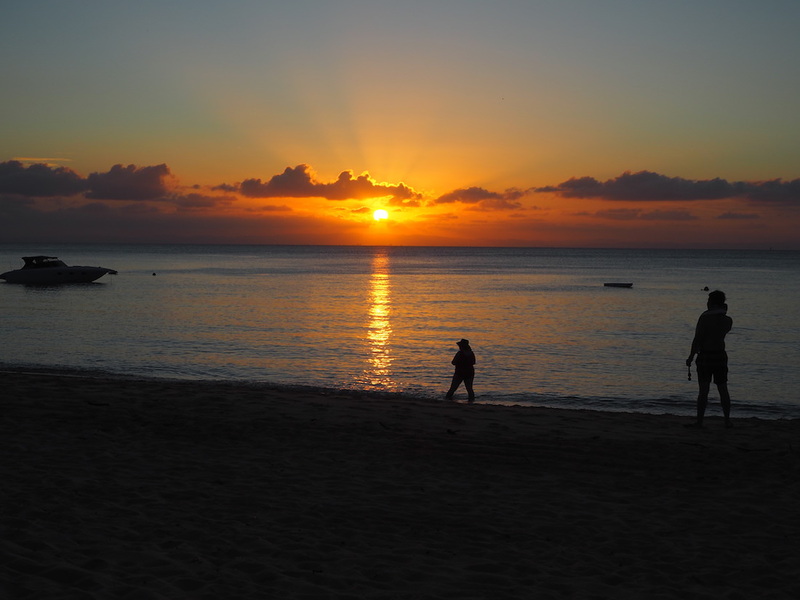 If like us you are coming to the island just for the day, be sure to stay for the sunset. Tangalooma is famous for its stunning sunsets and it’s true the sunset was breathtaking. Everyone having dinner left the table every few minutes to go and photograph the change of colour in the sky with the sun setting in the water. And of course once the sun has set it’s time for the most popular attraction on the island, the dolphin feeding. 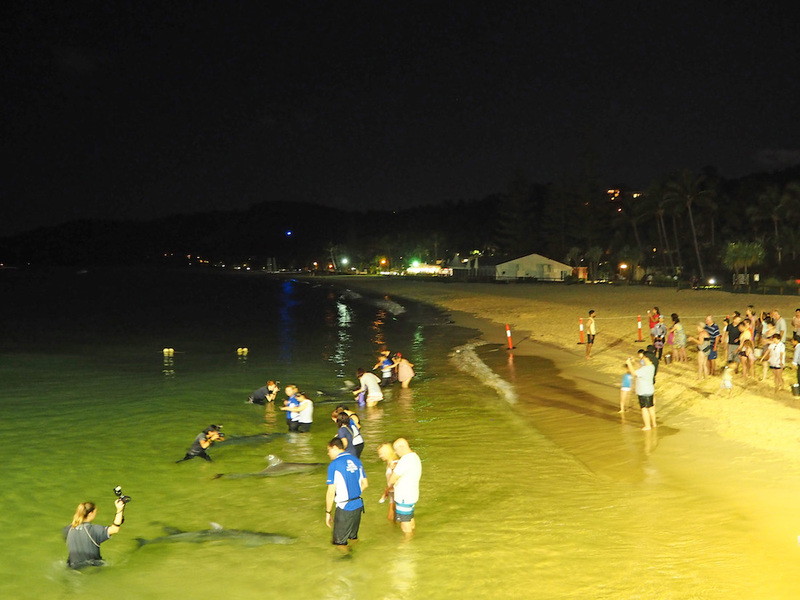 Every night a pod of wild bottlenose dolphins come to shore to be hand fed fish by the many tourists. It was a nice experience but it gets very busy so you end up waiting in line for a while! There are very strict rules around the dolphins and touching and patting is not allowed. Enjoy it while you can as your time with the dolphins is very short (just about a minute!). After this fun packed day we made our way back to the mainland by catching the last ferry which departs just after the dolphin feeding. 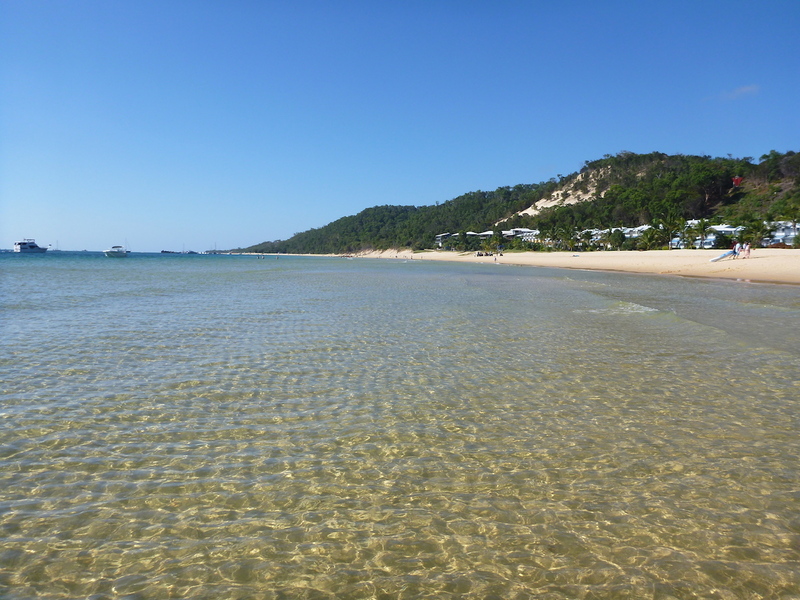 Moreton Island is a great place to go for a day out of the big cities. There are so many things to do on the island that there is no way anyone could get bored! So if you ever happen to be on the Gold Coast and have run out of things to do. Or simply are not interested in all the theme parks and the craziness that can be the Gold Coast. A day on Moreton Island is your answer. Of course you can just as easily get there from Brisbane as it’s even closer!